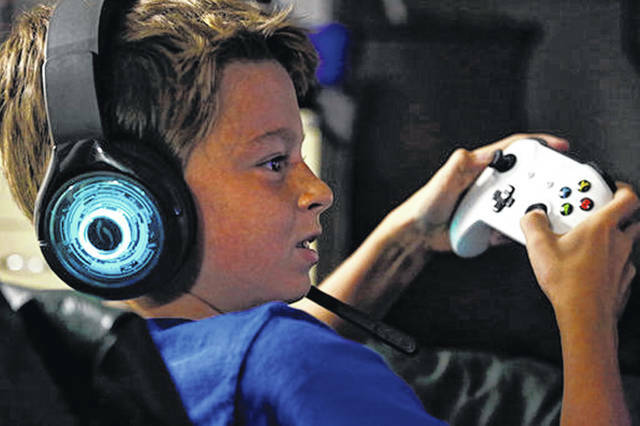 Henry Hailey, 10, plays the online game Fortnite in the early morning hours of a Saturday in September in the basement of his Chicago home. His parents are on a quest to limit screen time for him and his brother. The boys say they understand sometimes, but also complain that they get less screen time than their friends. Henry Hailey, 10, left, watches videos on YouTube while his mom, Barb Hailey, cooks dinner in Chicago. Screens have invaded the lives of young people on various levels, from social networking to school, making it difficult for parents to limit screen time. How much is too much? Some experts say the focus should instead be on how children are doing in school and functioning in the world, as well as how physically active they are. CHICAGO — It is Saturday morning, and 10-year-old Henry Hailey is up at the crack of dawn. Still in PJs, his microphone-equipped headphones glowing blue in the dim basement, he fixates on the popular online game “Fortnite” on a large screen.